A piping bag is a kitchen tool used for decorating cakes, pies, cookies, and other pastries, and also for squeezing doughs, batters, creams and puréed ingredients like potatoes onto platters or baking sheets. A piping bag is basically a bag in the shape of a cone. The bag is filled with the ingredient to be piped ​and then twisted to force the ingredient toward the pointy end of the cone. The pointy end is open and can be fitted with any number of tips which will produce a different decorative effect. Piping bags come in all sizes from very large for doing big jobs to extremely tiny ones for doing finely detailed work on cakes and cookies. Pastry cream is often piped through a bag, and choux pastry dough is piped onto a baking sheet for making cream puffs or eclairs. Piping bags are also used for filling pastries, like doughnuts that are filled with cream or jelly. Piping bags are usually made of canvas, which makes them durable, with a plastic coating on the inside which makes them easy to clean and reuse. But disposable plastic ones are often used, too. 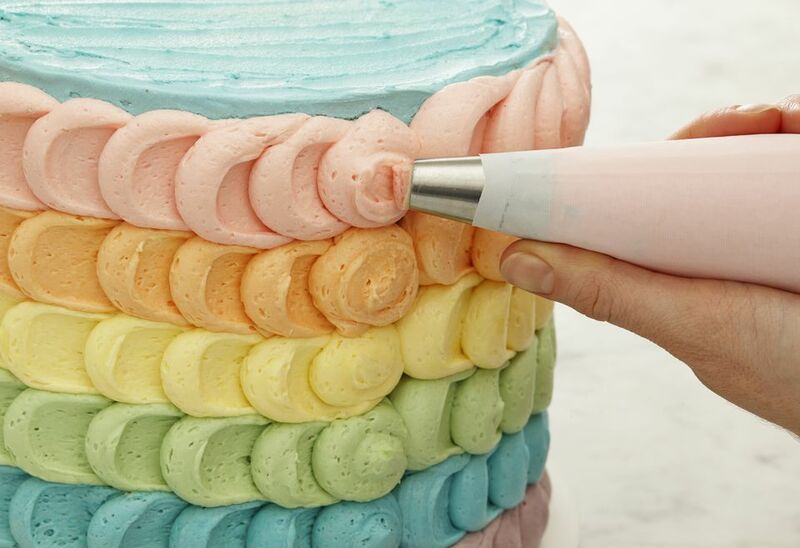 A piping bag is usually fitted with a coupler at the pointy end, which makes it easier to swap out different tips — otherwise, you'd have to reach through the bag of frosting to change the tip. The easiest way of filling a piping bag is to attach the desired tip, then fit the empty bag point-down into a glass quart jar. Then you can wrap the wide end of the bag over the mouth of the jar like a cuff and then simply spoon your ingredient into the bag. If you're using a disposable plastic piping bag, you'll need to snip the tip off the end of the bag before getting started. But don't just snip it off without measuring the size of the tip you want to use, otherwise the tip might just fall through the hole. If you're using a coupler, you'll need to insert the inside half of the coupler first, then the tip. Finally, with the tip situated in the opening, now fit the outside half coupler over the outside of the tip and screw it on tightly. When you're ready to fill the bag, most people find it works best to hold the bag around the middle and fold the opening over their hand to form a cuff. That way when you go to spoon the frosting or mashed potatoes or whatever into the bag, the ends don't flop around, which typically results in spoonfuls of filling dripping down the outside of the bag. Only fill the bag 1/2 to 2/3 of the way full. The actual piping is something that takes practice and you'll learn to get the feel of it, but the general procedure is to twist the loose part of the bag so that your hand is right behind the mass of filling. Then gently press from the back. If you squeeze from the middle, you'll end up with filling coming out the back of the bag. So it's important to keep it twisted tightly while controlling the pressure with your fingers. It takes practice!